By Appointment Only.Combining innovative design and thoughtful planning, 147 Hope Williamsburg is a sleek, modern building with 38 spacious, unique homes. From the textured façade, to its layered setbacks with careful placement of terraces set against a dramatic 20' tall curved entrance, the architecture showcases the dynamic movement and line that accentuates the building and its interiors. With its bicycle motif informing the design concept, spoke-like beams and arches are elements carried throughout the building, intersecting the lobby, meandering in the landscaped courtyard and crossing onto terraces. 147 Hope Williamsburg boasts the ultimate New York luxury - light filled spaces, generous layouts, panoramic glass walls and windows, unparalleled unique floorplans, top of the line material selections and a curated package of amenities. 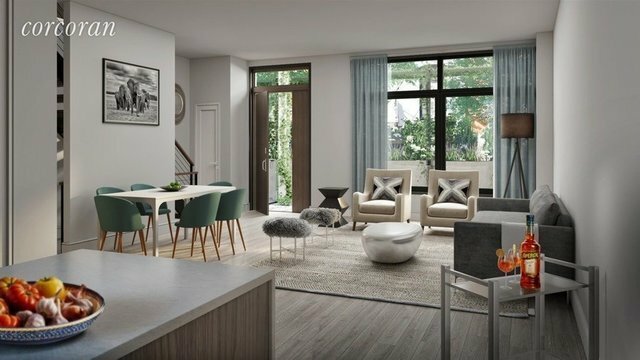 This development features 38 residential units comprise townhouses, penthouses, and classic condos with enormous private terraces roomy enough for outdoor dining or gardening. Ranging from 2075 to 2,504 square feet, these are one-of-a-kind residences to grow into. Triplex townhouses provide ample room to spread out, with private street entrances, enormous outdoor spaces and multiple living areas. Multiple exposures, soaring windows, balconies with glass railings, as well as open stairwells, allow light to filter throughout the interior. These townhomes include multi zoned air-conditioning system. Wide-plank oak floors, polished quartz countertops, and up to 11-foot ceilings enhance the breezy feel. Kitchens are outfitted with Thermador kitchen appliances: 36" Professional five-burner gas ranges and range hoods; stainless-steel refrigerator; microwave; 56-bottle wine column; Bosch dishwasher; Glacier White Quartz countertops and slab backsplash. Each unit has in-unit washer and dryer hookups and fresh air exhaust system. The bathrooms include Rohl plumbing fixtures hexagonal marble bathroom flooring, Bianco Dolomite marble tile, custom solid-surface console with dual sinks and nickel finishes, American Standard Lyndon dual-flush toilets and a Kohler tub; separate glass-enclosed rain shower.This is a 2,118 square feet 2 bedroom, 2 bathroom townhouse with an enormous recreational great room with 807 square foot garden.147 Hope Williamsburg is surrounded by the best of Brooklyn, but when you're home, life centers around terrific common spaces that include the sky deck and multiple landscaped community gardens. The building features a light-filled lobby with virtual doorman and package room, resident's lounge, fitness center, baby stroller parking and private storage. Residents will feel free to confine the dirty work to the basement bike repair room and pet grooming station. On-site parking is available for purchase with electric car charging station available.You'll find everything you need within blocks of 147 Hope Williamsburg. There are multiple transportation options, including the L/G/J/M/Z subways, and express bus service to Manhattan, and other Brooklyn and Queens neighborhoods. Cyclists can take pride in Williamsburg's bike culture; indeed it is an underlining design theme at 147 Hope Williamsburg. From our building, cruise the many different bike paths to Williamsburg Bridge or to other attractions and destinations around the neighborhoods and boroughs within minutes.For more information please visit www.147Hope.comThe complete offering terms are in an offering plan available from sponsor File NO. CD-170379.